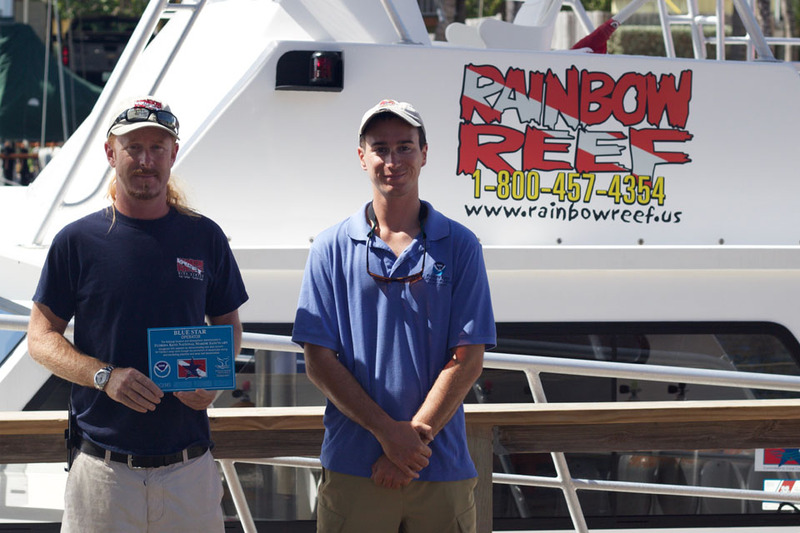 NOAA’s Florida Keys National Marine Sanctuary welcomes Rainbow Reef Dive Center of Key Largo, Florida as the newest participant in the Sanctuary’s Blue Star education and conservation program. The Blue Star program, which recognizes companies that commit to training snorkelers and divers in low impact practices, has grown to about 20 operators since its inception in 2009. Research has shown that education can lessen the impact that snorkelers and divers have on marine ecosystems, because they are more careful to avoid damaging contact with corals and other marine life. 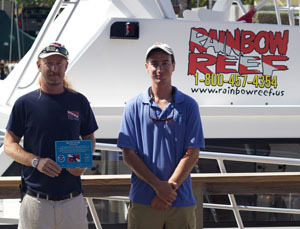 Rainbow Reef Dive Center staff proudly display their new Blue Star decal . Click for high-resolution version. Rainbow Reef is one of the largest dive shops in the Florida Keys and offers various conservation related specialties for divers, assists with Coral Restoration Foundation, Diving With A Purpose, and PADI's Dive Against Debris program, among others non-profit and governmental agencies. The sanctuary is home to the third-largest living barrier coral reef in the world, and is visited by hundreds of thousands of snorkelers and divers each year. This contributes to an estimated $2 billion in annual ocean-based tourism revenue. The reef’s close proximity to land and an abundance of boat operators in the Keys make it easily accessible to both novice snorkelers and seasoned divers. Operators become Blue Star certified by attending annual training on issues affecting coral reefs, sanctuary regulations and coral reef etiquette. In turn, Blue Star operators educate their customers by incorporating the information into certification classes and dive briefings. They also must offer conservation-related dive courses and participate in activities such as fish counts and reef clean-ups. Operators are re-evaluated on an annual basis. Visit www.floridakeys.noaa.gov/onthewater/bluestar.html for more information on the program and a list of recognized operators. Florida Keys National Marine Sanctuary protects 2,900 square nautical miles of critical marine habitat, including coral reef, hard bottom, sea grass meadows, mangrove communities and sand flats, as well as shipwrecks and maritime heritage resources. NOAA and the state of Florida manage the sanctuary. Visit us at http://floridakeys.noaa.gov, find us on Facebook and follow us on Twitter. NOAA’s mission is to understand and predict changes in the Earth’s environment, from the depths of the ocean to the surface of the sun, and to conserve and manage our coastal and marine resources. Join NOAA on Facebook , Twitter and our other social media channels.